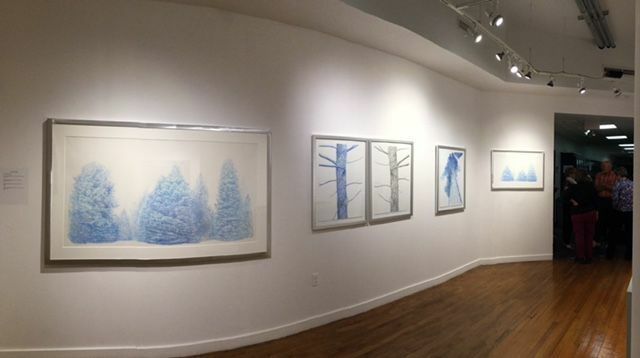 Stacey Cushner draws/creates to design the forest and nature as a mythical Utopian peaceful place landing in a blue tree dream world. The Utopian idea is based on the ancient Judaeo-Christian model of a better world, a hopeful future and a prototype for all-embracing bliss. 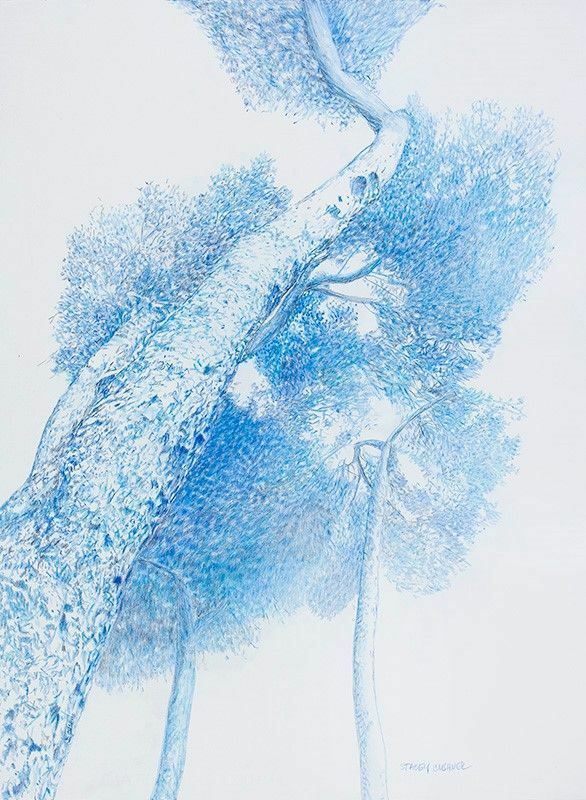 Stacey Cushner draws to design the forest and nature as a mythical Utopian peaceful place landing in a blue tree dream world. The Utopian idea is based on the ancient Judaeo-Christian model of a better world, a hopeful future and a prototype for all-embracing bliss. 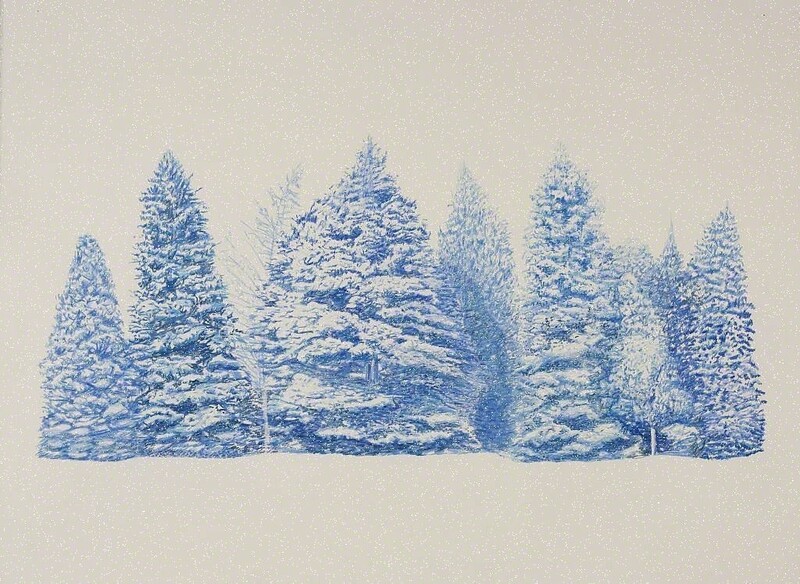 Her blues trees drawn in blue color pencil embrace light and air. They are in pointillism, meaning she uses tiny dots of various blue colors which become blended to produce depth of color and luminosity. 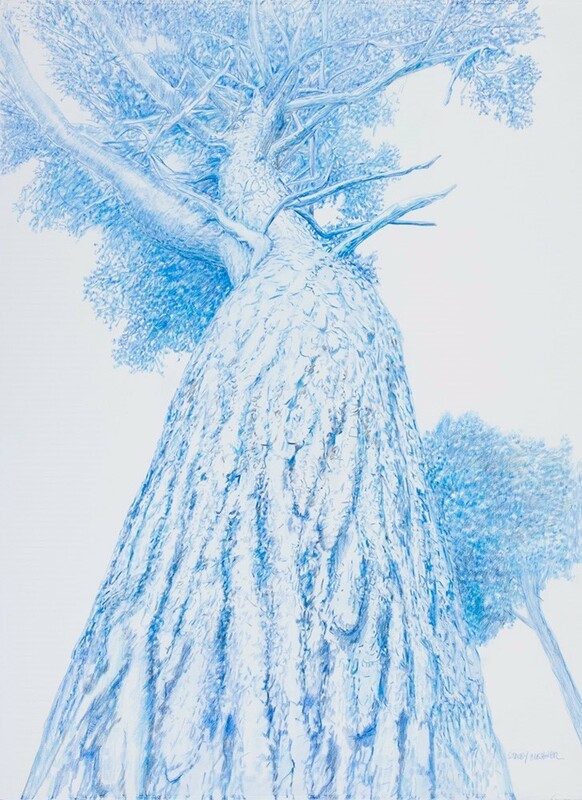 Her large oak trees in graphite and blue pencil botanicals could be gathered from the garden of earthly delights, they depict images of natural textures and shapes found in nature. 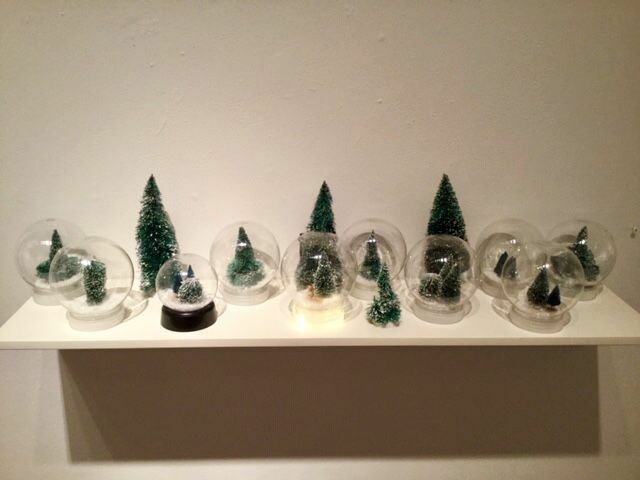 The several snow globes lined up with forests in each, except for one, convenes a scenic world, the title of her show and the title of this work. In one of these globes, a couple is embracing and looking towards the forests, a rendition of the Garden of Eden. 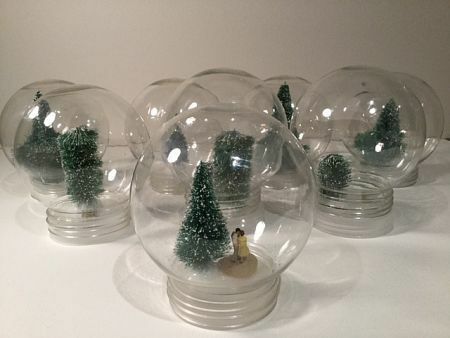 The small forests are in their own bubble worlds. 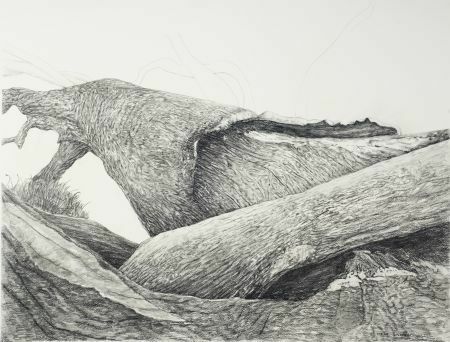 Her works allow us to escape into a harmonious, natural world. Stacey Cushner Boston-based drawer and painter who studied Fine Art at Brandeis University and received her MFA in Visual Arts at Lesley University’s College of Art and Design. She teaches drawing and painting at the Museum of Fine Arts, Boston and the Southern Vermont Arts Center. Cushner has shown her work most recently in SCOPE Art Basel, Basel, Switzerland; Art Southampton, Southampton, NY; Art Silicon Valley, San Francisco, CA and the Boston International Fine Art Show, Boston, MA. Her work is included in private collections. She has exhibited her work in solo, two-person and group shows around the world. She has received prizes for her work, including an honorable mention from New York City’s Hollis Taggert Galleries and an honorable mention at the Blanche Ames National Exhibition in Massachusetts. She was the artist-in-residence at Red Gate Gallery in Beijing, China, The WYE in Berlin, Germany, and the OBRAS Foundation in Holland. Her work was featured in The Art Guide, New York. Please see www.staceycushner.com for an extended CV and also her most recent work.